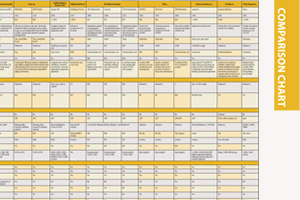 This article appeared as an introduction to a Comparison Chart on Advanced Visualization Systems in the June 2013 issue. Advanced visualization software continues to make surgical planning more efficient and accurate as technology advances. Surgeons can map out procedures based on images from computed tomography (CT), magnetic resonance imaging (MRI) and positron emission tomography (PET) exams, among other types of digital imaging and communications in medicine (DICOM) modalities. The images allow physicians to see areas of interest from multiple angles, and isolate various structures, organs and vessels that are of interest in a matter of minutes. This advancement in technology has increased physician interaction and provided an opportunity for enhanced patient education that was not previously available. One way that advanced visualization has moved healthcare forward is in the area of efficiency and accuracy. Physicians can now scan through multiple images of the area in question within seconds. Not only can they isolate certain structures within the scan — soft tissue or bone for example — the range of filters in typical software enables them to create an image in the clearest, most beneficial format possible. There are filters specifically for bones, vessels, soft tissue and much more. The filters and isolation capabilities offer greater accuracy and ease in spotting abnormalities. The ability to construct 3-D images has also aided greatly in patient education both pre- and post-operatively. “In the old days you would throw up a film on a light box and the patient wouldn’t know what you were pointing at, so they would kind of have to take it at face value,” Mastracci explained. These days, Mastracci sits with all of her new patients, shows them their CT scan and goes through the anatomy. With the 3-D images, patients can visualize the process. Physicians can explain to patients the intricacies of surgery and explain why they will be performing a certain procedure, any obstacles that they foresee and why certain recommendations have been made. Once the surgery is complete, physicians can return once again to show patients what has taken place. This unrestricted access of images has created a greater sense of community amongst surgeons. Prior to having online access to images, surgeons referring patients to physicians outside of their practice would have to mail a disk with the images to the physician, which took at least one day. Then the receiving physician would have to load the images to their workstation, and if both physicians did not have compatible software, there was still a chance that images would not be able to be viewed. Today, Mastracci said that physicians are able to share, discuss and meet online, making the handover from surgeon to surgeon quicker and easier. “I find that it really kind of made our community that much closer from that point of view,” she explained. It is clear that the software has become a mainstay for many surgeons, and Mastracci noted that all of her colleagues at Cleveland Clinic Foundation not only use the software, but are dependent on it. “It’s something that we incorporate into our practice and instill in our residents for vascular surgery training,” she concluded. 1. W Nyanue, “Rebirth of PACS/RIS,” ITN, 53(1) 23-24.